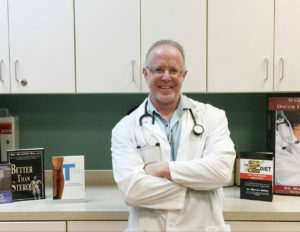 Dr. Warren Willey understands the unique health challenges we face today and enjoys connecting with a wide variety of audiences. As a former competitive bodybuilder, he speaks to fitness-focused athletes. As a veteran medical practitioner, he speaks to concerned medical professionals. As a fun-loving husband and father of three awesome children, he speaks to regular women and men trying to live healthier, happier lives. His message is positive and uplifting and his speaking style is encouraging, forthright, and unpretentious. As a young boy, he suffered from debilitating asthma and a host of other health issues. Surrounded by inhalers, nebulizers, and breathing machines at the age of ten, Warren would often lie on his back and watch movies as his friends ran around outside. Determined to make a lasting difference in his quality of life, he began exercising regularly and he focused on changing his diet. His studies led him to suspect that gluten might be at the root of his asthma struggles. Sure enough, when he eliminated gluten and put himself on a low-carb diet, his health transformation was remarkable and noticeable. This transformation started a lifelong quest to help people become the best version of themselves by becoming their guide to healthy, holistic living. When he discovered osteopathic medicine he knew he had finally found his life’s calling. One of the world’s foremost experts on holistic health, he did his residency training at The Mayo Clinic. His preventative and proactive approach helps people achieve optimal health and fitness through elite nutritional programs, diet strategies, and exercise regimens. Dr. Willey helps people to live healthier, happier lives—from body builders to stay-at-home moms, from professional athletes to weekend warriors, from doctors and nurse practitioners wanting to heal to their patients rather than simply write a prescription. Now he wants to empower your audience to fully realize their potential—to live a healthier, happier life. A personal phone consultation with Dr. Willey prior to your event to customize the message and approach to deliver the best results for you and your audience. An authentic, passionate, and professional presentation focused on achieving the outcomes you want with your audience. A custom slide presentation, if appropriate to your setting and audience. Follow-up communication after the event to make sure Dr. Willey’s speaking met your expectations. This presentation has been popular in high schools and colleges around the USA. It has been presented to some of the top track and field athletes in the country at the Simplot games in Pocatello Idaho. It reviews and helps the observer understand how to truly improve performance and maintain a healthy advantage. Dr. Willey covers some of the secrets only known to professional athletes to really excel and succeed. Dr. Willey also covers some of his absolute must supplements for any person participating in strenuous athletics or activities. RecoverMe is a philosophy. It is a way of life. The amount of stress on individuals today is making health-related goals such as weight loss, physique obtainment, treatment and prevention of disease, etc. very difficult. Western medicine has completely missed the boat when it comes to optimal living and a good quality of life. The RecoverMe philosophy teaches the five primary tenants of health and how to optimize them all for an amazing quality of life and happier and healthier living. This presentation discusses and reviews all the factors involved in healthy and successful weight loss. In particular, it teaches the listener how to maintain weight loss for life. Weight loss is a lot more than eating less and exercising more. If one does succeed under eating and over exercising, it most certainly fails them shortly thereafter. Beyond Weight Loss provides more detail of the physiology of fat loss and fat gain as this is essential that it is understood so a personalized, long-term weight loss plan can be developed. Aging is a lot more than just counting the years in a chronological manner. Biologic aging is based on genetics, epigenetics, cultural factors, lifestyle, etc. In other words, you have more control than you think! In this presentation, Dr. Willey covers some of the primary thoughts in the aging process and how truly to optimize aging for a happier and healthier life and the quality of living that is impossible to gain without understanding these key factors. This presentation is named in honor of one of Dr. Willey’s most popular books. It answers important questions such as who is your doctor and can you trust him or her? What are the true consequences of our lifestyle? Are we genetically predetermined to age a certain way or die at a certain point? How has modern medicine influenced the way we age? Is there something better? Is there something more powerful? Does our entire thought process and understanding of aging need to change? The answer to these questions and more are all in the presentation, What Does Your Doctor Look Like Naked – Your Quest for Optimal Health. And he loves offering his best advice to men and women who just want to live healthier, happier lives in a holistic way that results in deeper and richer relationships with family and friends. Invite him to speak to your group and he’ll Help You Live a Healthier, Happier Life. Please fill out the information form and you will be contacted for pricing.